Each novella is written to tug the heart of the reader and discussion questions for book clubs or others are included at the end of each story. The tales are individual and not connected, which makes it fun to read the conclusion of one before starting a brand-new story. These four ladies are well acquainted with writing stories in this genre. Some of them I am a great fan of and read every book that is published. A couple are new to me, so I look forward to reading more of their work. A Legacy of Love is written by Amy Clipston and her unique style of writing shows us how important it is to follow God rather than knowingly make a wrong choice that would make for hearts filled with misery. I also enjoyed watching the main character, Leon, learn to love again when he didn’t think it would ever happen. The Cedar Chest is written by Beth Wiseman. I enjoyed the tale that reveals God can take past mistakes or current ones and heal the broken hearted. This is a very touching tale of legacy that unveils to the characters the unknown about themselves or others. The tale showed how even though some may think no one has ever had hard times in their marriages. What is cool is how the wisdom gained in the past is shared with the current generation to help build a marriage. The Treasured Book by Kathleen Fuller tells of a man who is no longer happy in the English world and is searching for something. One of his interests is books. Years before he gave a miniature book to a girl as friends, one she treasured and kept with her. The miniature book was a tiny Bible. 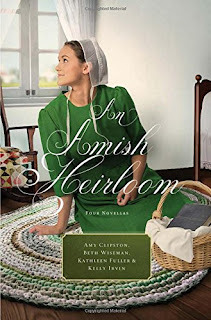 The man must choose how he will live, as an Amish man or English? Does that include a possible budding romance? The Midwife’s Dream by Kelly Irwin is the final novella in the collection. Iris is a midwife who enjoys her work, but her heart wonders if there will ever come a time where what she desires most will be fulfilled. While her friends are married and Iris is delivering their bundles of blessing, each birth challenges her to thank God for the baby’s safe arrival. She prays He will bring a special someone to her at the right time. Grab the book and enjoy each unique novella, and then tell others who might also like to read a good book!